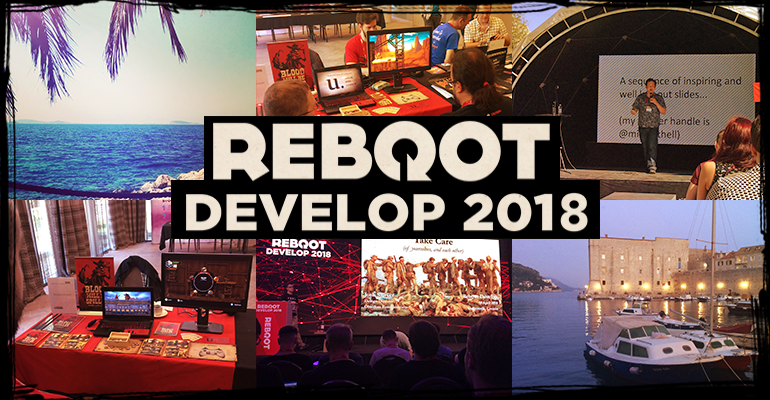 Reboot Develop 2018 took place in Dubrovnik, Croatia on 19th – 21st Apr 2018. It was our second time at Reboot and it was one of the best conference experiences we had on this project. TL;DR: It’s an amazing very well organised conference, with great people, awesome speakers, taking place in one of the nicest venues you can imagine. If you’re an indie developer and your budget allows for it, we recommend it highly. When we attended Reboot in 2017, things didn’t really go according to plan. At that time, we were really busy with applying for the support from Slovak Arts Council and it was also the period when our discontent with the core combat mechanic was reaching its peak. We did little to no research about the speakers and the conference schedule, we neither arranged any meetings, nor had a plan to go and see the Dubrovnik Old Town. We went to the conference with a poorly tested demo we weren’t happy about and almost no preparation at all. 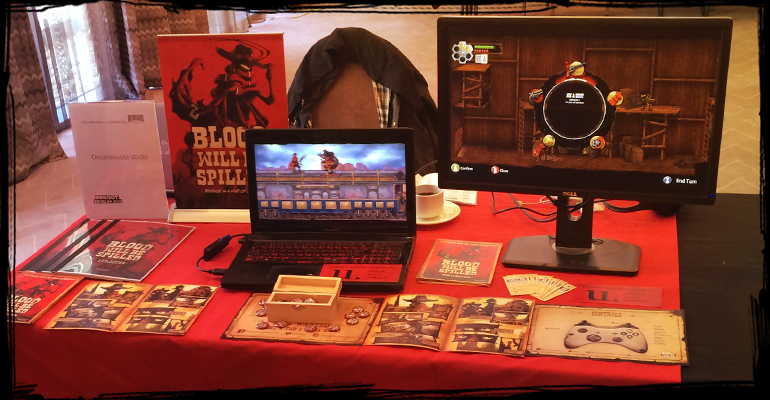 As a result we needed to pack our booth on the very first day, because the demo was barely playable and had to make the whole conference into a kind of a holiday – listening to talks, talking to people, having strolls by the coast. We also took a lot of notes and promised to ourselves that next time we’ll do our homework better. We knew that this year’s Reboot was going to be a very important conference for us. Not only did we make a great progress on the project since last year, but we also wanted to show people our new vision of the combat mechanic. Moreover, our whole team attended Reboot this year, not just me and my brother (as was the case last year). The preparations for Reboot Develop started in the middle of February. We allocated time to create a properly tested and polished demo, prepare booth branding, business cards and simple merchandising. Everything went pretty much according to plan, except for the trailer, which I finished around midnight the day before the conference. So, how did it go? The Demo – I don’t really remember when was the last time we had such well received demo by anyone who tried it out. Of course we received a lot of feedback for small tweaks or changes to the game, but overall, people really enjoyed the game, especially our new combat mechanic (which we were a little anxious about). People also understood what kind of game it is that we’re making and also complimented the art style. The build was also pretty stable, apart from some occasional bugs here and there. Devoting so much time to testing and bugfixing it weeks before the conference really paid off. Whole team present at the conference – Apart from the fact that it was a lot of fun to spend those few days in each other’s company it also allowed us to switch places at the booth in case someone wanted to see a particular talk or try out some games in the indie expo. Booth branding – Even with our very limited budget for these kind of things and our very limited logistic options (since we were coming by plane), this turned out to be a great success. We had red t-shirts, red xbox controller, red tablecloth and a small red rollup. It really made us stand apart in the sea of black tables and tshirts. We also brought with us badges and small 2-page comic books (inspired by our friends from Breadcrumbs interactive) about the backstory of our protagonist. People really appreciated that they could take something with them after they played the game and even when we talked to someone, the comic book allowed us to easily explain the setting and basic premise of the game. Also a special shout out to our colleague Kristián who brought us a monitor by car all the way from Bratislava. Food and drinks – When showcasing a game at a conference like this, it’s really easy to forget about staying hydrated or eating properly, especially when you’re having a good time. This time we were prepared, bought a big six pack of bottled water and we switched places with the guys to be able to get lunch at the hotel. Meeting old and new indie friends – What I really enjoy about showcasing in the indie expo at a conference like this is meeting a lot of fellow indie devs in the expo, sharing experiences, talking about games etc. 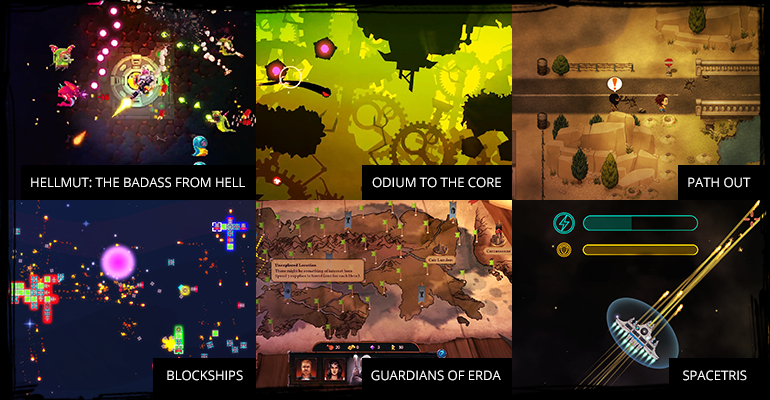 Some of the games worth mentioning include Hellmut: The Badass from Hell, Path Out, Blockships, Spacetris, Guardians of Erda, Odium to the core, Monks Island, FAR: Lone Sails, Inked and Tormental (hope I didn’t forget about someone). We also met a lot of great people from other bigger studios or companies, who gave us great feedback or offered help with some things in the future. Arranging more meetings in advance – Conferences like this are usually one of the best places to meet in person people you won’t meet that often (press, AAA devs, publishers etc). Even though that we really tried, there were still things that we were finishing up until the last minute, so I didn’t manage to get in touch in advance with everyone I wanted to. Lack of tutorial in the demo – This is quite self explanatory. We thought that the overall mechanics of the game are easy to grasp and that in rare cases when something wouldn’t be clear, we would be there to explain it. While this is indeed true, with a proper tutorial, we could just leave people alone to play at their own pace, not looking over their shoulder the whole time. Not attending talks – While our main goal at the conference was to showcase the game, there were still a lot of great talks that could be valuable to us. We’ve seen a few of them (by Mike Bithell, or Rami Ismail), but missed other good ones. A better planning and time management could help us solve this next time, hopefully. Parties – While the parties were indeed cool, I think there was a little dissonance between what the parties were supposed be for and how they actually were. From what I understood (and some of the devs I talked to as well) it was supposed to be a place for informal networking, where you could follow-up with people you met at the conference, or just chat with people. And you could of course do both of those things at the parties, but 1) It was really hard to find anyone in the crowd in the dark, and 2) The music was always so loud, that you had to really shout if you wanted to have a conversation with someone. Maybe just dividing the parties into “networking” and “party” section would be enough to make everyone happy. So, to sum it up, Reboot Develop 2018 was a blast, we really enjoyed our time there and we’re very happy for all the feedback we got and contacts and friendships we’ve made. We already know what to improve next time we’ll go there and are really looking forward to visiting Dubrovnik once again in 2019. In the meantime, if you want to be up to date with our development, make sure to follow us on facebook, twitter, or instagram. Take care cowboys!